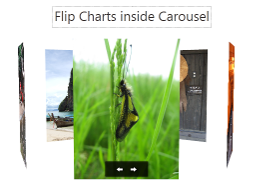 Note: Of the ordered collections, the Asset Flow, Carousel. Flip Chart, and Helix are indexed. This means each contained item possesses the triggers Moved into focus and Moved out of focus. With these triggers, Intuiface users can create experiences that react when a particular item is scrolled into view. As noted above, collections can contain assets and/or other collections. 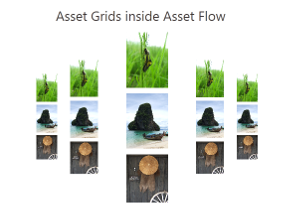 Contained assets can be located either in the Content Library in or folders added to the Content Library. Regardless of location, asset and collection types can be mixed. Aside from the Slide Show collection, which is fully automated, collections are interactive, enabling users to browse collection content via tap and swipe gestures, In addition, aside from the Group, Pinboard, Scroll and Slide Show collections, content can be "popped out" for further interaction via tap and drag-and-drop gestures. To add an asset into an existing collection, drag the asset from the Content Library over to the collection in the scene or into the collection's listing in the Scene Content panel. To place a new collection inside an existing collection, select the latter in the Scene Content panel and then follow the steps above for creating a collection.You can also drag-and-drop one collection into another within the Scene Content panel. You can use a Windows folder as a dynamic source for your Collection as well as a data feed provided by an Interface Asset. 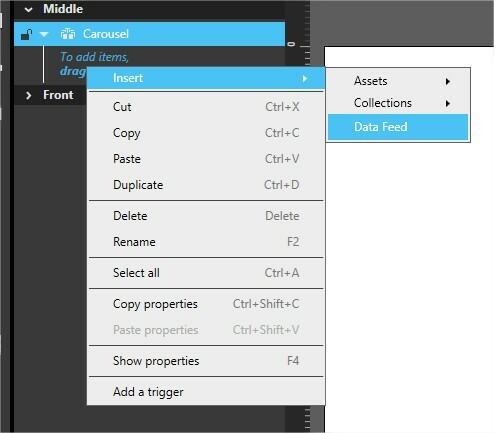 To insert a data feed in a collection, you can either create the collection directly by drag & dropping the Interface Asset on the scene or using the contextual menu of the collection in the scene structure. Right click on the collection, select Insert then Data Feed. 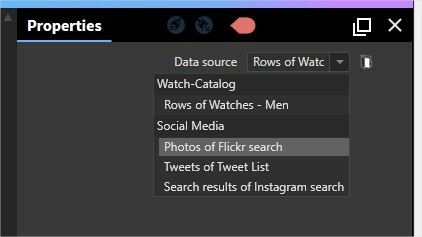 Then select the Data Feed and in its properties, pick the data source you want to display in this collection among your Interface Asset feeds.